Pictured above are Donald Fowler and Mary Greenwood, who were the oldest man and woman at a Christmas treat on Saturday, December 9th, for Silsden's senior citizens. The event continued a community tradition of providing a Christmas tea for the elderly. The Friends of the Town Hall treated 60 senior citizens over the age of 75 to a splendid buffet and music by the Swing Cats Trio. The provision of a gift for the the oldest man and woman at the party also revived a tradition. These honours went to Mary, who is 98, and Donald, 97, who pipped Norman Akeroyd by less than six months. 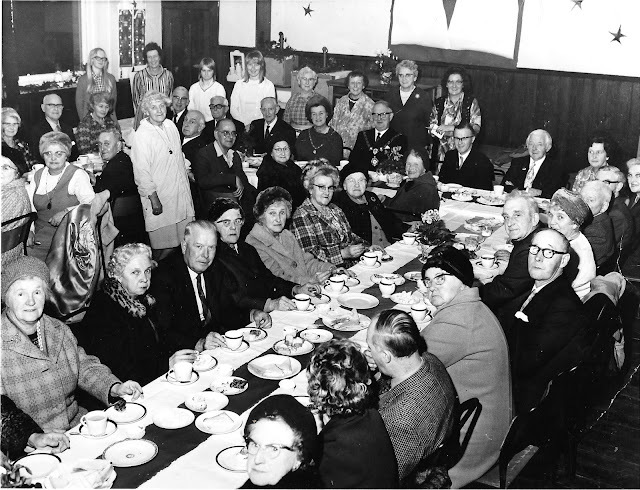 The organisation of a Christmas get-together for local pensioners began after the Second World War and by the 1960s the community catering team were serving 230 teas and taking out a further 130 treats, plus a bag of coal, to elderly residents who were too frail to attend. This photograph by the late Will Baldwin shows the chairman of Silsden Urban District Council, Councillor J. J. Barker, and his wife, Norah, at the top table in the 1960s. They are wearing the chains of civic office. This photograph, also by Will Baldwin, shows another Christmas tea in the 1960s. The festive event disappeared in the 1980s but was revived last year by the Friends of the Town Hall with generous funding from the Harry Beverley Tillotson Trust. 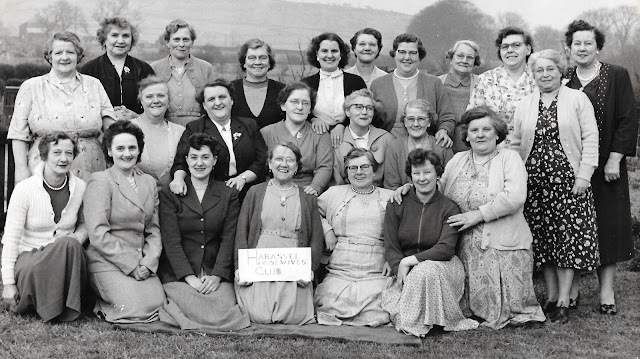 As a postscript I am repeating a Will Baldwin photograph from my blog of November 8th, 2016, showing members of Silsden's Harassed Housewives Club. I am doing so because the women include, third from left kneeling in the front row, Mary Greenwood, who at 98 is the subject of the first picture above. Next to her, fourth from left, is Mary Jane Smith, whose daughter Ivy is 87 and attended this year's Christmas tea. The photograph also includes Mrs Rose, Mary Sharp, Joan Hill, Ada Brooks, Miriam Parker, Alice Heaps, Mrs Tillotson, Violet Inman, Mrs Roberts, Mrs Rush, Elizabeth Lamb, Mrs Shackleton, Mrs Robinson, Mrs Moorehouse, Mrs Baldwin and Kitty Gledhill.